Who's Behind A String Of Bombings In Ukraine's Black Sea 'Pearl'? ODESSA, Ukraine -- Oleg Konstantinov, the editor of a news website called Dumskaya in Ukraine's port city of Odessa, pulls up a map on a computer screen in his small, crowded newsroom. 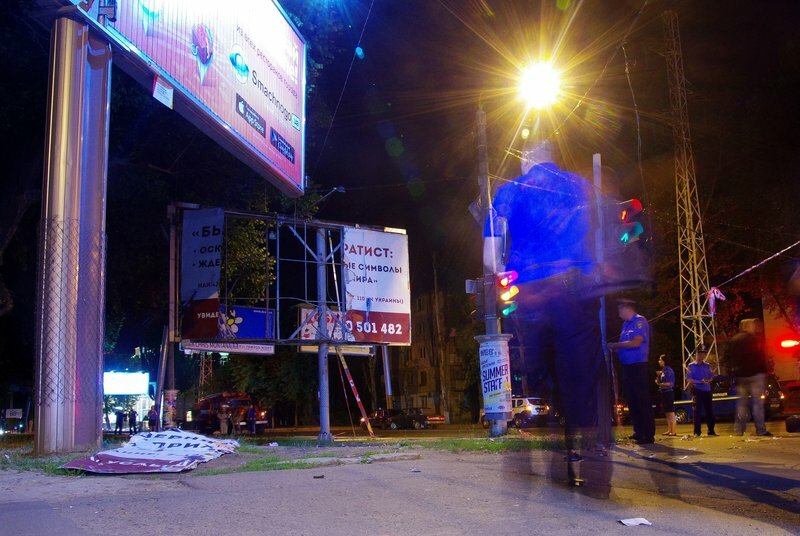 Police search the area near a destroyed billboard reading "Crimea is Ukraine!" following an explosion in Odessa on June 12. It's dotted with red, yellow, orange and green fire-burst icons, indicating where 34 bombings have taken place in the city over the past year or so. Konstantinov and his fellow journalists have been plotting the locations, looking for patterns in the data from the attacks and trying to figure out who organized them. "These bombings were obviously committed by different groups," Konstantinov says, as he moves his cursor over the icons. "We're basing that conclusion on the kind of targets they chose, the type of explosives they used, the timing of the attacks — actually, quite a number of facts." Security forces have arrested suspects in several of the attacks and Konstantinov says they, too, fit a pattern. They're all men who want to see Odessa and its region split from Ukraine and become part of Russia. Konstantinov says they tend to be middle-aged, poorly educated Soviet army veterans who may belong to different pro-Russian fringe groups. Known as the "pearl of the Black Sea," Odessa has always been a crucial trade hub as well as a rich prize in centuries of wars and political intrigue. Nowadays, it's key to the conflict between Ukraine and Russia — which began in February of last year, when Russia seized Ukraine's Crimean Peninsula, east of Odessa. The process of understanding the city's recent attacks becomes a lot less analytical when you talk with people who've experienced the bombings, like Natasha Vasyuchenko. She's a small woman with a weathered face and a smoker's husky voice, working the night shift in a cigarette kiosk on a busy street in one of the grittier parts of Odessa. She was dozing when she was snapped awake by a blast in the wee hours of June 12. "Something like an earthquake happened and all the cigarettes just fell down off the shelves," she says. "The police appeared, and then I walked to the corner and saw this destroyed billboard." A few minutes later, there was a second blast. Both bombs shredded billboards carrying the slogan "Crimea is Ukraine!" Konstantinov says that unlike bombings in some other Ukrainian cities, these attacks don't seem to be targeting civilians. Only one person so far has been killed, a street cleaner who may have picked up a bomb by accident. "The impression is that these people are trying to get attention for their cause rather than do real damage," he says. "In that sense, they're not acts of sabotage but more like classical terrorist acts," he says. The implication, he says, is that the bombers don't want to alienate the population, in hopes that more Odessans will eventually embrace the separatist cause. Another online journalist, Vera Zaporozhets, an editor at the news website Southern Courier, tells me the investigations of the bombings are complicated by the fact that Ukraine's security services have long been infiltrated by Russian agents. "You probably realize that there are Russian spies in Odessa, even in the security service," she says. "And all those people still keep working — in the police and prosecutor's office." Zaporozhets says there's only a small group of security service officers who are really trying to prevent terrorist attacks — and they're helped by civilian volunteers. Vadim Labas, the lead research analyst for a group called Oberig, a Slavic word that means "protective charm" or "amulet," is one of those volunteers. His group gathers information and passes along tips to trusted members of the security services and journalists. Oberig's researchers discovered that pro-Russian organizers were paying people to stage demonstrations for separatist-related causes over the past year. The researchers tipped off journalists, who exposed the payoffs in local media. Labas says he knows there's a danger of retaliation from the pro-Russian side. "They have a list of people who oppose them, with photos and profiles," he says, "and they've promised that after they take over Odessa, there will be tribunals and public executions of 'traitors' in the city soccer stadium." He and his colleagues are determined to make sure that day never comes. "We know it's a dangerous situation," he says, "but we keep on fighting."